PHILADELPHIA, PA – July 12, 2017– Janney Montgomery Scott LLC (“Janney”), a leading full-service wealth management, financial services and investment banking firm headquartered in Philadelphia, PA, today announced that Carlton E. Anderson II, Vice President/Investments, has joined Janney’s Darien, CT branch office. Anderson was previously affiliated with MassMutual. Anderson is entrusted with over $82 million in client assets and has over 25 years of experience in the financial services industry. He began his career as a bonds and equities sales broker before transitioning to financial advisor in 2005. He graduated from the University of New Hampshire, resides in Greenwich with his wife and two children, and serves as Vice President of the Greenwich Business Club. 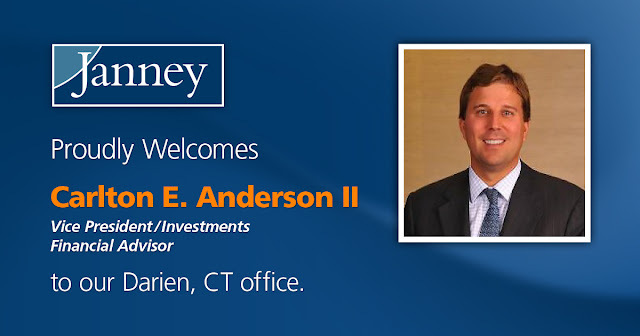 Anderson is the eleventh experienced financial advisor to join Keith’s Connecticut complex in the past twelve months. Janney’s Darien, CT branch office is located at 800 Post Road, 2nd Floor, Darien, CT 06820.